Next, we need a replicable stroke. A duplicable stroke is key. Many putting strokes work great for a short period of time, then collapse. We are looking for a sustainable stroke that can be understood and duplicated under all conditions. A stroke that won't buckle under pressure. The following stroke works for any grip or stance. The natural putting stroke will take a straight, then slight inside back, to straight, slight inside forward curved line. 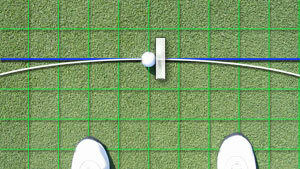 (see image) Try standing on the tile (grid) again, but this time focus on the putter head as you stroke it back and forth. (Let your head move slightly with the putter head to help keep the putter head in focus.) You can actually see the arc! The putter actually opens and closes, on an inside to inside stroke. The putter head is actually staying perpendicular to the arc line. That is a natural stroke. Anything other than that is destined to break down. So, we have this very slight inside to inside stroke. How do we keep it replicable? We don’t have to do anything to make this stroke replicable. We simply need to stop trying to keep it unnaturally straight. We need to first eradicate a common misconception which inhibits the natural dynamics of the putting stroke. We need to stop trying to keep the putter head square throughout the putting stroke. Though logical, it’s actually the cause of erratic, streak putting. Do you want your putter head straight at impact? YES! But not throughout the stroke. To demonstrate, make a putting stroke on a tiled floor (or on any other similar grid patterned floor). Deliberately take the putter back from grid line to grid line. You will discover that you need to close the putter head on the back stroke and open it on the forward stroke to keep it square. Why does it feel so awkward? Because it's unnatural. You are interfering with the natural direction of the stroke, which is a wide shallow arc. This wide shallow arc is due to the rotation of the shoulders and chest around the spine, and the slight angle of the putter itself.